This textbook of political economy has been written by a group of economists comprising: Academician K.V. Ostrovityanov; Corresponding Member of the V.S.S.R. Academy of Sciences D.T. Shepilov; Corresponding Member of the V.S.S.R. Academy of Sciences L.A. Leontyev; Member of the All- Union Lenin Academy of Agricultural Sciences I.D. Laptev; Professor I.I.Kuzminov; Doctor of Economic Sciences L.M. Gatovsky; Academician P.F.Yudin; Corresponding Member of the V.S.S.R. Academy of Sciences A.I.Pashkov; and Candidate [Master] of Economic Sciences V. I. Pereslegin, Doctor of Economic Sciences V. N. Starovsky took part in the selection and editing of the statistical information included in the textbook. 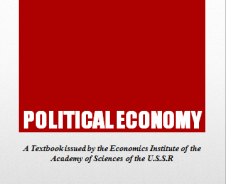 In connection with the drafting of the textbook a large number of Soviet economists made valuable critical observations and contributed numerous useful suggestions concerning the text. These observations and suggestions were taken into account by the authors in their subsequent work on the book. Of very great importance for the work on this textbook was the economic discussion organised in November 1951 by the Central Committee of the Communist Party of the Soviet Union. 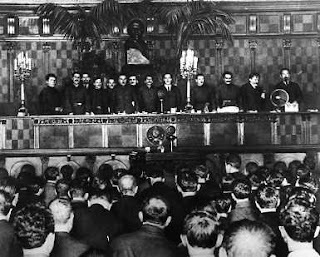 In the course of this discussion, in which hundreds of Soviet economists took an active part, the draft for a textbook of political economy submitted by the authors was subjected to a thorough critical examination. The proposals worked out as the result of this discussion for improving the draft of the textbook were an important source of improvement in the structure of the textbook and of enrichment of its content. The final editing of the textbook was carried out by comrades K.V. Ostrovityanov, D.T. Shepilov, L.A. Leontyev, I.D. Laptev, I.I. Kuzminov and L. M. Gatovsky. IX. Accumulation of Capital and Impoverishment of the Proletariat. XXVI. The Victory of Socialism in the U.S.S.R.